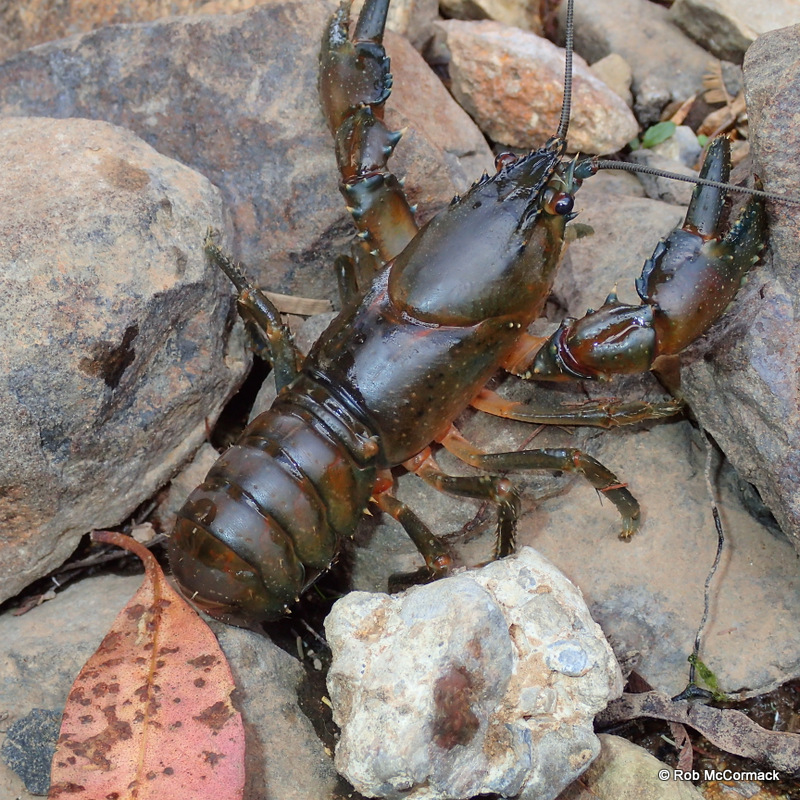 The Giant Tasmanian Freshwater Lobster is the largest freshwater crayfish on the planet. It’s reported to grow up to 6 kg and over 1 metre in length but, currently, animals weighing 2–3 kg are considered the largest regularly recorded. Astacopsis gouldi has been assessed as Endangered by the IUCN and listed as Vulnerable by the State of Tasmania. As such I expected the species to be hard to find. 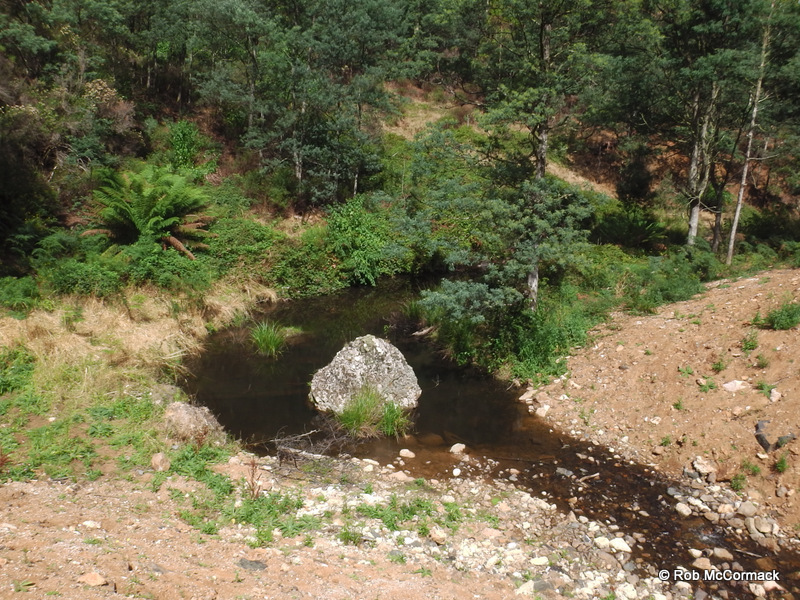 Just being a tourist in Tasmania and not set up or prepared to survey streams I managed to stop at 4 seemingly suitable streams to look for Astacopsis species. The first site I looked at was down at Strahan (Astacopsis tricornis) but I sent less than 5 minutes in the stream as my feet were too soft to handle the razors sharp and slippery rocks. 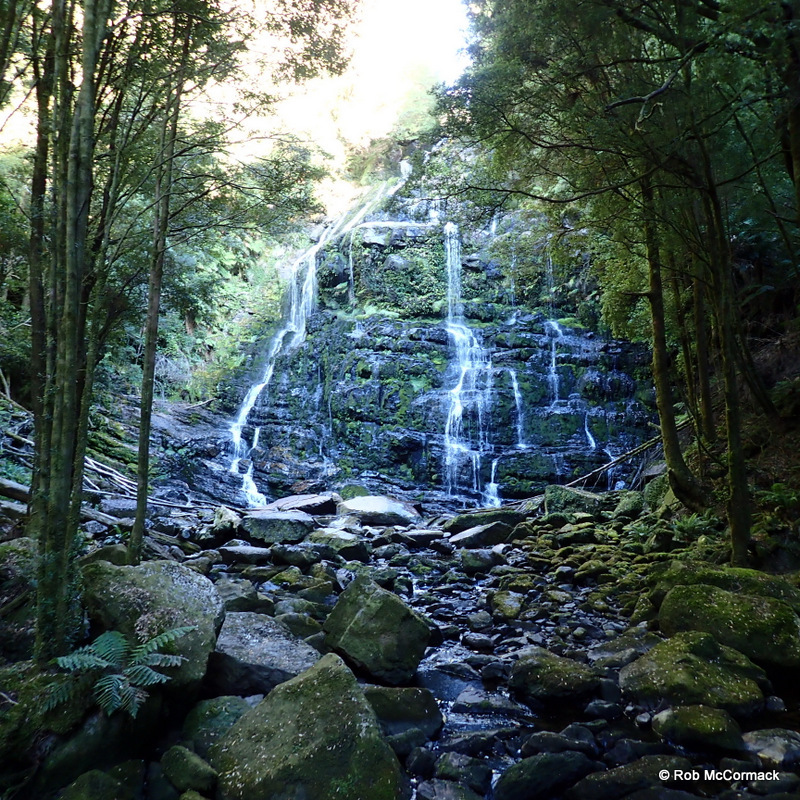 My next spot was in the stream beside the track to Nelson Falls on my way from Strahan to Launceston. I turned some rocks along the water’s edge without success – again (Astacopsis tricornis) known to occur in the area. After these unsuccessful attempts I managed to find a store in Launceston and purchase some gum boots and that was the turning point. As a tourist doing the tourist bit I was just traveling from one tourist attraction to the other but on the way I would cross a likely looking stream and hop out for a quick check. With my gum boots this made life easy and I could whip them on and get into the stream and turn a rock or two. 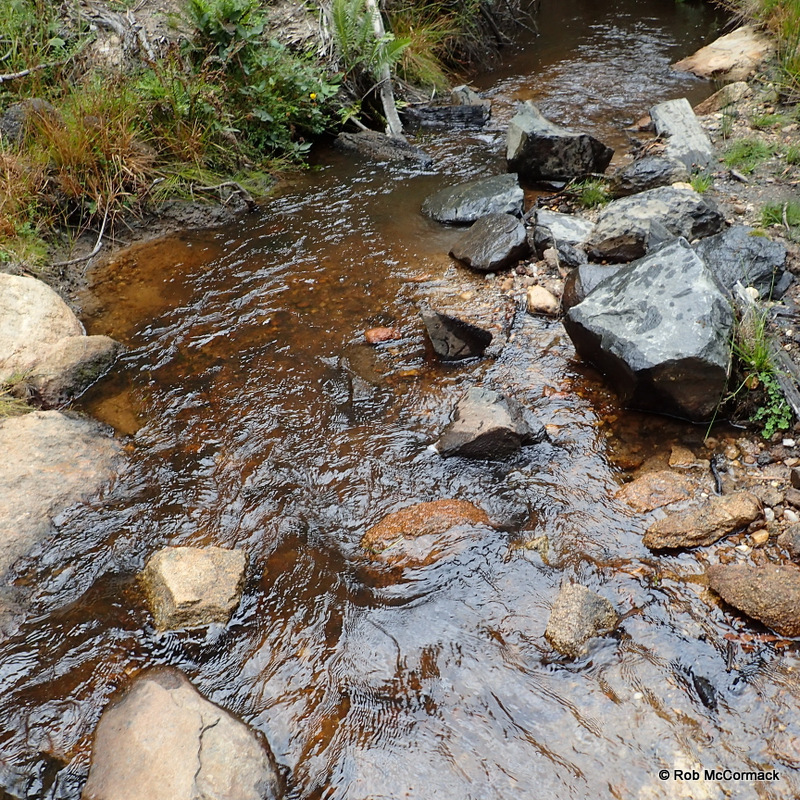 The first stream was Surveyors Creek (tributary Great Forester Rv), north Scottsdale. This was a small fast flowing stream and the first thing I saw when I looked in the creek were 6 very large trout around 700 gram. 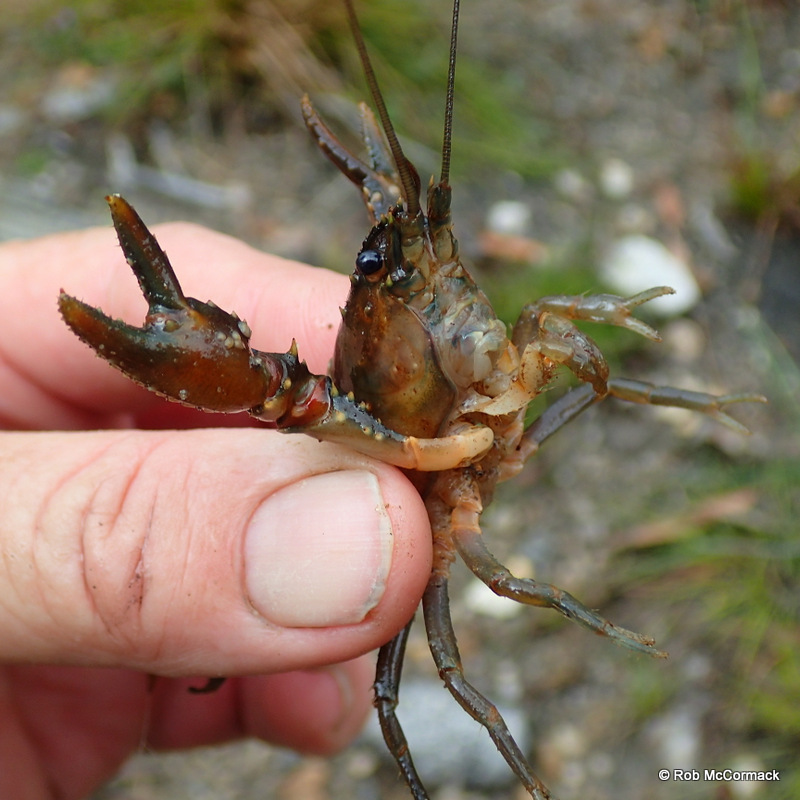 My first thought was that there would only be Engaeus crayfish along the bank which were also of interest to me or large giant crayfish too large for the trout to eat. However, with my boots on I decided to check out the critters in the stream and picked a rock and turned it. 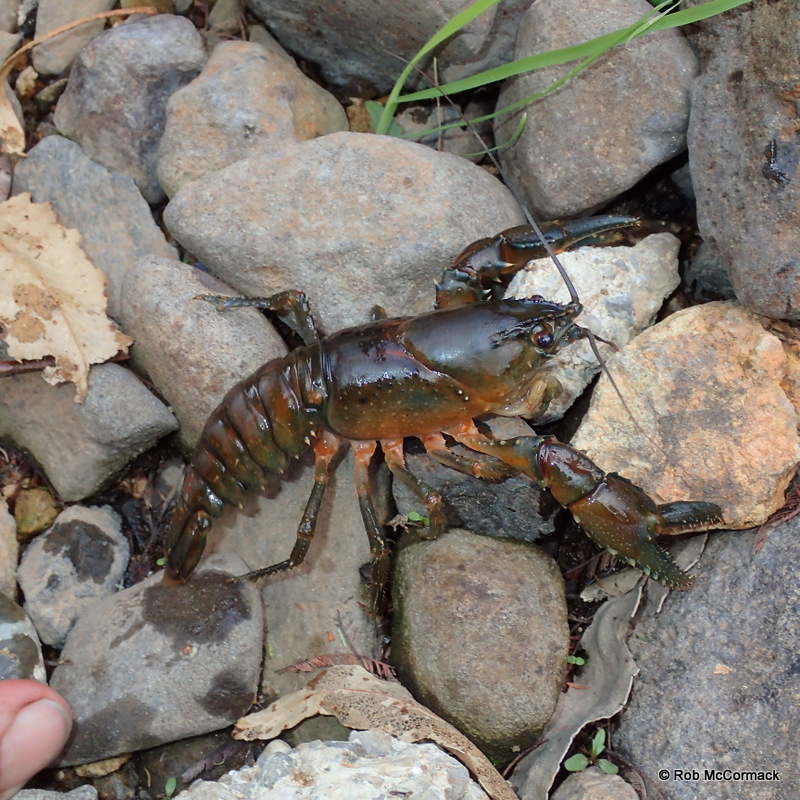 A small crayfish around 10 gram shot out and disappeared. That was a surprise to me as the trout could easily eat that critter but despite the trout it was alive and well. I only had no more than 10 minutes at the site as I did not want my partner in the car to get bored and be in the bad books so I selected my next rock to turn and sure enough, under that rock was a larger Astacopsis goulgi (female, 27.95 mm OCL). This species is known to be found in rivers and streams of all sizes, that drain north into Bass Strait so I expected it to be there just not so easy to find. It’s a slow growing species so to actually capture one under my second rock was a pleasant surprise. I did a quick photo shoot and moved on to the next tourist location. The next day I was driving along and we crossed the East Gawler River crossing Central Casta Road, Sprent. Again I put on my gum boots and went down under the road bridge to check out the creek. I picked my rock to turn and again a juvenile Astacopsis goulgi was sheltering under the rock (male, 37.15 mm OCL). This one was a bit larger than the first but still a relatively small juvenile. It was good to see the species is alive and well and hopefully on my next trip to Tassie Ill have the time to look for the gaints of the family.